Utilizing technology that mostly originated with treatments for humans, some animals are now being fitted with custom-designed prostheses. This effort portrays in clear, simple language and numerous accompanying, attractive color photographs the experiences of a wide variety of animals that have benefitted from prostheses. Felix, a lamb who lost a rear leg to a predator; Fawn, a calf injured at birth; and Allison, a sea turtle missing three of her flippers, are among the animals described. Brutus, a Rottweiler who lost all four feet to frostbite, can now chase squirrels. Some homegrown solutions include such cleverly crafted devices as a Rollerblade wheelchair for a goose, a skateboard for an African tortoise, and a brace with wheels that’s restored mobility to a paralyzed rabbit. 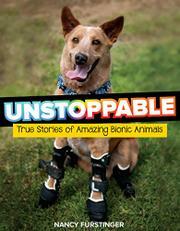 Following the brief chapters that focus on specific animals are some that describe the work of three makers of prostheses and orthotics, two of whom wear prosthetic limbs themselves. The text makes it clear that the challenges presented by disabled animals are unique, and each one requires creativity and imagination to surmount myriad obstacles. A refreshing minimum of sidebars makes for easy reading. Each chapter is printed on a different color background; one that employs white text on orange is less easy to read than others.